I’ve just returned from the annual migration of Sydney cyclists to South Australia to witness the increasingly popular Tour Down Under. This year, as well as watching the male professionals at their best, we were also treated to a four day women’s series. It’s not that there hasn’t been women’s racing incorporated in previous years but it was always just an aside. This year the organisers stepped it up a notch, promoted it well and attracted a world-class field. The four race series included two crits and two road races, raced alternatively over four days from Saturday, 17 to Tuesday, 20 January 2015. I missed the first race because I was busy volunteering at a charity event but watched the other three keenly including photographing the action. The race series forms part of the National Road Series (NRS) which will continue into 2015 with the added attraction of a number of high profile riders who race mostly in Europe but are in Australia for summer. 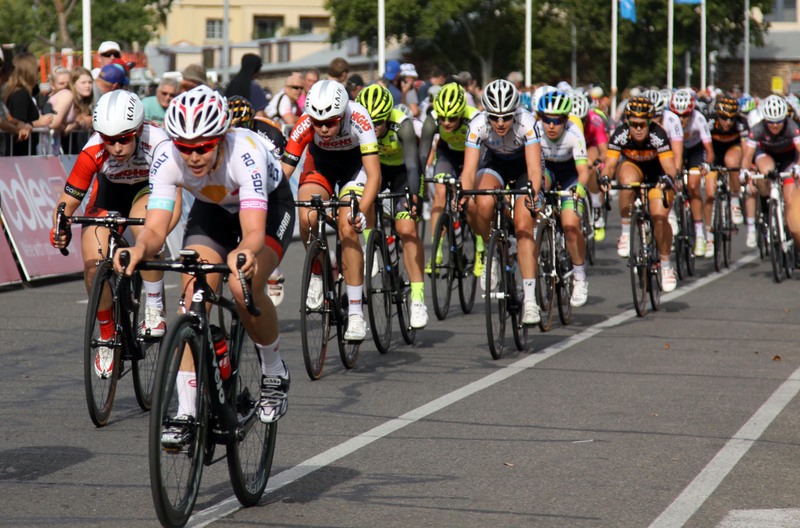 Wiggle Down Under (usually known as Wiggle Honda for European races) fielded a team including Aussie stars Nettie Edmondson and Chloe Hosking, Orica-AIS was well represented, as well as Tiffany Cromwell racing for the local Roxsolt team. More than 90 riders lined up on the start line at each event. I won’t provide a blow by blow description of each race, but I can assure you that the women race hard and fast and are very impressive to see up close. What I would like to share is how friendly and accessible the women were before and after their races. Unlike their male counterparts, the women are not kept behind barriers to keep the hoarding crowds at bay. That’s mainly because the crowds are not huge and the number of fans are at manageable numbers. I’ll share just one story with you….Prior to my visit to Adelaide I approached Nettie Edmondson via email to ask her if I could organise a quick meeting/photo with a young fan who is the daughter of a friend of mine. Keira is a nine year old track/road cyclist who became an instant fan of Nettie’s in 2012 when she did a school project on an Australian Olympian and Keira chose Nettie. Every since then Keira has followed her career and was really keen to meet her idol. So I sent Nettie an email and she replied that she’d be happy to meet Keira prior to one of her races. So we headed off to Tanunda for the road race on Day 3 of the series and approached Nettie who was busy getting ready for her race. Keira was a bit starstruck and lost for words, and Nettie was excellent at making conversation and making Keira feel at ease. A few photographs were snapped and we left Nettie to prepare for her race. Keira declared it the highlight of her holiday. Thanks Nettie. I also chatted with a few of the women before and after their races, as well as Wiggle Down Under team manager Rochelle Gilmore and found them all friendly and approachable. 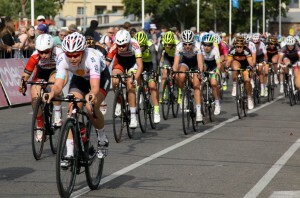 It was particularly great to see a crowd of around 5,000 people at the Victoria Park crit race on Tuesday evening. The park is on the edge of the CBD and all the people there would have made a particular decision to attend the race. Great to see the fans out in force. Well done to the organisers of the event. I hope it returns next year even bigger and better. The Tour Down Under week is such a buzz, I loved being there again this year. It was fabulous to see the women racing and then riders like Kimberly Wells and Annette Edmonson up close after the races, cooling down, chatting and smiling. Such a pleasure to see the women’s races in higher profile. I agree, well done to the organisers of the event and may it continue to grow.